Yuanjie Mao, M.D., Ph.D., is the lead researcher on a study that showed that use of a continuous positive airway pressure (CPAP) machine in conjunction with dietary changes can aid in weight loss in obese patients with obstructive sleep apnea. March 25, 2019 | Use of a continuous positive airway pressure (CPAP) machine in conjunction with dietary changes can aid in weight loss in specific patients, researchers at the University of Arkansas for Medical Sciences (UAMS) found in a study that is being highlighted by an international professional society for endocrinology. 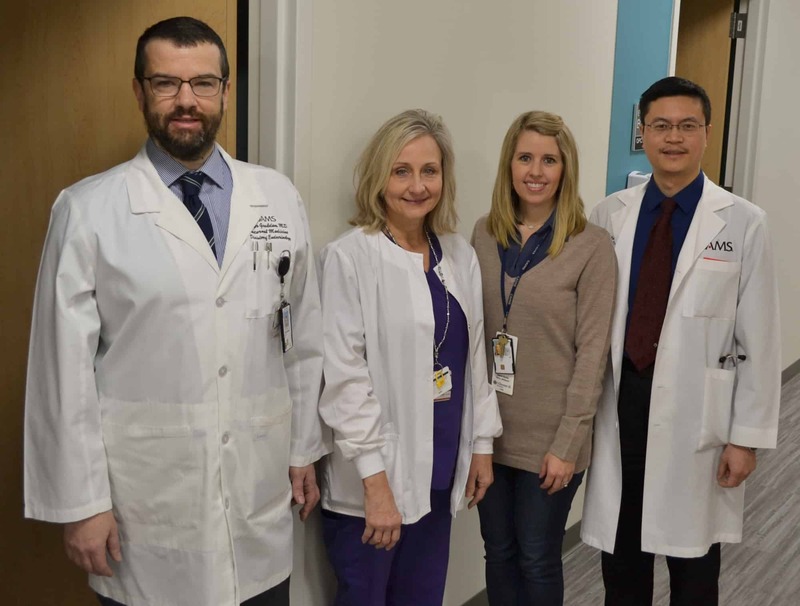 Yuanjie Mao, M.D., Ph.D., is the lead researcher on the study and is a fellow physician in the Division of Endocrinology and Metabolism in the UAMS College of Medicine Department of Internal Medicine. The study is being featured at the Endocrine Society’s annual meeting, ENDO 2019, March 23-26 in New Orleans. Yuanjie Mao, M.D., Ph.D., far right, and his research team, from left: Peter Goulden, M.D. ; nutritionist Jan Wall; and nutritionist Laura Quick. The most common cause of obstructive sleep apnea in adults is obesity. Wearing a CPAP machine during sleep is the first-line treatment. However, some people may think the CPAP will not be needed if they lose weight and attempt to lose weight without initiating CPAP treatment. The study looked at patients undergoing a 16-week intensive calorie restriction program that included exercise, weekly individual counseling and cognitive behavioral therapy. Some in the group with sleep apnea were treated with CPAP and others were not. The CPAP-treatment group saw a larger absolute weight loss than the non-CPAP group. Worldwide, obesity increased by 47.1 percent in children and by 27.5 percent in adults between 1980 and 2013. In 2016, globally 39 percent of adults were overweight, and 13 percent were obese. In Arkansas, 34.7 percent of adults were overweight, and 35.9 percent of adults were obese. Obstructive sleep apnea occurs when the muscles in the throat intermittently relax during sleep and block the patient’s airway. CPAP machines are worn over the nose or mouth and use a constant stream of air to keep the patient’s airways open as they sleep. The Endocrine Society is the world’s oldest and largest organization of scientists devoted to hormone research and physicians who care for people with hormone-related conditions. Endocrinologists are at the core of solving the most pressing health problems of our time, from diabetes and obesity to infertility, bone health, and hormone-related cancers. The society has more than 18,000 members, including scientists, physicians, educators, nurses and students in 122 countries. To learn more about the Society and the field of endocrinology, visit our site at www.endocrine.org.